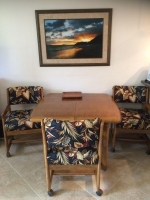 .Enjoy a wonderful Kihei Kai Nani condo. 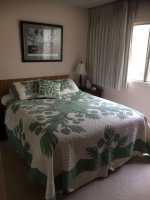 This first-floor, air-conditioned condo is located only a minute from the famous Kamaole 2 Beach. 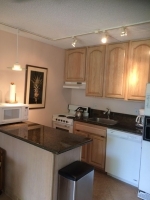 The condo has all the amenities, not the least of which is air conditioning to keep you comfortable during your stay. The washer and dryer save guests the inconvenience and expense of using the coin-operated machines by the office. A strong WiFi signal serves the entire unit, and there are two new flat screen TVs offering full cable service in both living room and bedroom! 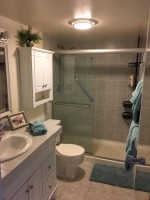 The new owners are in the process of upgrading appliances as needed. For your use they have just installed a new fridge (November 2017). This one-bedroom condo feels much larger than many Kihei Kai Nani units, which do not enjoy a front lawn like this one does. As you relax on the lanai on comfortable and handsome teak furniture, the front lawn stretches beyond the patio, providing green comfort and space that is exceptional among the complex's one-bedroom units. We look forward to hosting you during your stay on Maui!